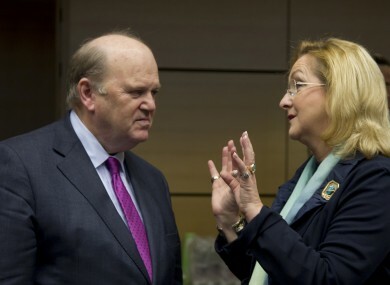 Finance Minister Michael Noonan, left, speaks with Austria's Finance Minister Maria Fekter during a meeting of EU finance ministers in Brussels on Wednesday. AFTER SOME WRANGLING, European leaders have agreed a unified system of bank supervision for the eurozone’s biggest lenders. The deal, reached overnight after 14 hours of talks, was completed just in time for the beginning of the final EU summit of the year, which begins later today. Supervisory powers for about 200 banks have been conferred on the European Central Bank as part of the agreement. It will also be responsible for the overall functioning of the rescue fund, the European Stability Mechanism (ESM). The European Council hopes that by setting up a Single Supervisory Mechanism (SSM), the “vicious circle between banks and sovereigns” will be broken as it banks can be recapitalised directly. As part of the agreement, the ECB will have direct oversight of eurozone banks but in different ways, depending on the country and its national supervisory authorities. It will also work in tandem with the EU-wide European Banking Authority. Non-eurozone member states who wish to participate in the ESM will be able to do so by entering into close-cooperation arrangements. In a statement, the Council said the ECB’s monetary tasks will be kept “strictly separated” from supervisory tasks to eliminate potential conflicts of interest. The ECB will, however, not be given its new powers until March 2014 – or 12 months after legislation comes into effect – to ensure it is ready. Of Europe’s 6,000 lenders, about 200 will be supervised by the ECB. The agreement comes after overnight talks between the EU’s finance ministers, including Ireland’s Michael Noonan. Some areas of supervision, such as consumer protection, money laundering and payment services, will remain with the national regulators. The EU summit, which begins today, will see the next tranche of loans released to Greece. Email “European leaders agree on bank supervision”. Feedback on “European leaders agree on bank supervision”.